Today I went to a nursing home with some ladies from my Bible study group. Two of us took our children with us. We took doughnuts and business cards from church. I didn't really want to go, as I feel a little emotionally fragile sometimes after the loss of my Dad and my Grandma last year. I've never had any emotional baggage about visiting nursing homes, but suddenly this year it seemed difficult. However, the lady who arranged our little field trip lost her dad (who had been living in this nursing home) last week. So...I couldn't really wimp out when she was being so strong. We learned from the nurses which patients were allowed to eat doughnuts, and we went room to room, just saying hello. In one of the last rooms we met a blind man. He didn't seem to be familiar with the word "doughnut" but he told us he had been praying for a "man of God" to visit him. He felt that we, five ladies with six children, were an answer to his prayer. He told us that he prayed for each staff member of the nursing home ("from the general manager to the housekeepers") and then he said "last week they put my wife in a grave." One lady stayed and prayed with him while the rest of us moved on. On the way home, I talked with my kids about this man, because I didn't know if they had realized that he was blind, and I knew that my 7 year old had been a little worried about "the sad man". My 4 year old said, "That man prayed and Jesus said "yes!" to his prayer and He sent us! He was so sad and now he is happy." Of course at 4 she doesn't understand the sorrow of losing a spouse, but she does understand that Jesus answers prayer, and she felt that she was part of that answer. She felt that Jesus used her today. The kids knew that they were going to "give gifts" (doughnuts) to the residents today. We didn't know that we would receive the gift of being used by Jesus. I've subscribed to InStyle magazine for years because I have a great fear of turning into the stereotypical unstylish homeschool mom. I know there are some stylin' homeschool ladies out there, but the denim jumper and the sandals with socks are burned into my memory as the uniform of the homeschool moms I used to know. I am determined not to lose touch with the fashion world. Usually my InStyle magazines are stacked under my bed until I notice that there are ten or twelve of them, and I throw away all but the last two. This week, however, I noticed something else under my bed: my Style notebook. Several years ago when I was hoping to lose the baby weight quickly, I cut out all my favorite stylish pictures and put them in a notebook. I didn't lose weight quickly, but I did have a clearly planned wardrobe that year. Yesterday I browsed the last three months of InStyle, the Penney's catalog, and the Coldwater Creek catalog (CWC, incidently, seemed to be aimed at grandmothers this month. Nothing for my Style book there.) I cut out pictures and glued them on green paper, and hole punched it for my notebook. I ended up with about nine pages of my favorite fashions--not the Oscar gowns, not the little black dresses, but clothes I would actually wear if I found them at affordable prices. i sorted them into church & dinner out clothes, everyday clothes, and makeup ideas. This really makes me want to stick with my exercise routine (see Fat Burnin' Friday post) so that I can do a little shopping! 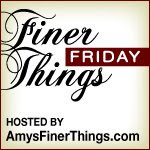 Finer Things Friday is hosted here. Last spring I lost about seven pounds one month. My exercise routine was very simple: just put on my pedometer and my ipod, and run/walk/jog in the house. This allowed me to work out in a way that didn't hurt my back, and didn't require time out of the house. I walked between three and seven miles a day, probably five days a week. We went on a 5 week vacation last summer and I lost my exercise routine. Life and grief and boredom got in the way of restarting the routine. The familar landscape of my own walls or even the view out the window just didn't inspire me to walk. A month or so ago, I found a way to make this fun again. Our library has quite a few travel dvds, and I can request them online and pick them up when they arrive at the nearest library branch. Most of them are divided into 25 minute segments. I pace myself, trying to reach .4 miles with each 5 minutes, thus reaching 2 miles with each segment. My favorite travel hosts are Rick Steves, Rudy Maxa, and Globe Trekker. So far I've walked "through" Ireland, Scotland, England, Belgium, France and Italy. Last night my children were watching with me, fascinated by the huge wheels of cheese in Parma, Italy. My husband works all day and comes home with stories of his experiences away from the house. Now I have interesting foreign facts to share: Sicilians eat ice cream for breakfast, Belgians buy fresh chocolate daily like French people buy baguettes, and Scottish postmen let travellers ride along with them because there isn't a good bus system in the remote areas. Teach me to talk with You intimately. Help us...today, to give our dreams and hopes and hurts to You. Restore in us a clean heart, we beseech You, oh Lord. sometimes granting us glimpses of heaven. to respond with love and obedience. I started blogging just over a year ago. I was in a high stress period of life, which led to a grieving period. My blog was my outlet, my place to yell about the stress or chatter about something completely unrelated to it. Now the stress and the grieving have levelled off, and I'm just....tired. And forgetful. I think about my blog, and I wonder if I actually have something meaningful to say. I think of some silly chatter to blog while I'm doing dishes, but I forget it by the time I turn on my laptop. I miss my little blogging outlet. Perhaps I can come back this afternoon. From an album by Stefan Van Voorst, available at cdbaby or itunes.com. The words are modernised without losing the beauty of the prayer. The tune is catchy and upbeat but still prayerful. Did you ever notice that Jesus didn't say that fathers always give their children fish when they ask for fish? Sometimes when my children ask for Captain Crunch cereal mid-afternoon, I think about the cheerios they had at breakfast, the sandwich they had at lunch, and the popcorn they had for a snack--and I give them an apple instead of yet another starchy food. God gives good gifts--they just aren't always what we were expecting.